So what is a file index, and what does it do? Once you've set up your home's filing system you aren't adding all your papers into it all at once, but a few here and a few there. So when you come across something to file, say a bill that just comes every three months and you've got to save for tax purposes, you may not remember the name of the folder you placed one of those bills in. The result, you might figure it out after a lot of searching, or you might figure you didn't have a file set up yet, and create a new one, with a new name. Uggghh. It happens, and it can quickly create chaos in what you hoped was a good coherent system that you spent hours creating. The more stuff you file the more likely this is to happen. Especially if you've got more than one drawer of files. Fortunately, there is a forehead slappingly simple trick to keep this from happening to you. It's a file index, which is basically like a table of contents for your filing system. 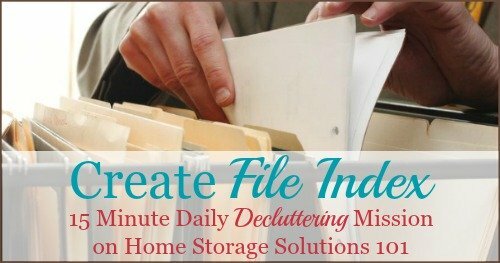 Create it when you first set up your filing system (here's a list of suggest file categories you can start with), and then add to it as needed, and just reference it each time you struggle with where to file something. 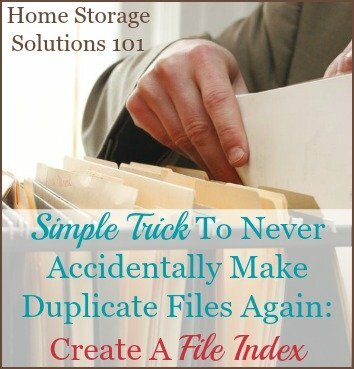 This index is really just a simple list of all the main file categories and subcategories you've made that you keep in the front of your files. 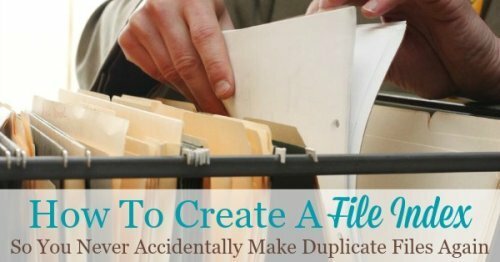 It is much easier to scan down a list of file names rather than to look at each file, especially if you've got multiple file drawers. Consulting the list might help you realize you need to add something to the "medical file," instead of searching in vain for a file called "doctors." Also consult the list when you think you need to create a new file. Perhaps you do, perhaps you don't. For ease of adding new items to your index list, in alphabetical, or whatever other order you keep your files in, I suggest typing this list into a word processing document so you can edit it as you add to and remove things from your filing system. Sure, make a pencil or pen notation of a new file every now and then on the printed file index, but periodically update the paper index, inserting things into their right order pn your list just like you do the files themselves, to easily keep the index legible and scannable most of the time. Who says every organizational trick needs to be hard to do? You can get more paper organization tips here. I hope seeing these instructions have gotten you inspired to declutter and organize your files.